Zotac reveals the ZBOX nano XS AD11 Plus, a new Mini PC that is 17 percent smaller than Zotac's previous smallest computer. Measuring just 106mm x 106mm x 37mm, this system features AMD's E-450 APU with integrated graphics, 2GB DDR3 and a 64GB mSATA SSD. The full specifications can be viewed over here. ZOTAC International, a global innovator of graphics cards, mainboards and mini-PCs, today redefines the mini-PC form factor with the extra small ZBOX nano XS AD11 Plus mini-PC. The ZOTAC ZBOX nano XS AD11 Plus is the world’s smallest PC capable of delivering a rich high-definition desktop computing experience. An AMD E-450 APU with Radeon™ HD 6320 graphics processing sits at the heart of the ZOTAC ZBOX nano XS AD11 Plus to render beautiful Microsoft DirectX 11 graphics and playback stunning online and offline high-definition content. The completely new ZOTAC ZBOX nano XS chassis shrinks the ZBOX nano chassis by nearly 17-percent into a 106-milimeter box that is only 37-milimeters tall that can easily slip into a jacket pocket. Solid-state storage makes a ZBOX debut in the ZOTAC ZBOX nano XS AD11 Plus with a 64GB mSATA SSD as the internal storage source for lightning-fast boot times and system responsiveness. External storage expansion is available via eSATA, USB 3.0, USB 2.0 ports and a Memory Stick and SDXC compatible memory card reader on the ZOTAC ZBOX nano XS AD11 Plus. New high-amperage USB 2.0 ports enable the ZOTAC ZBOX nano XS AD11 Plus to easily charge the latest high-end smartphones and tablets while simultaneously transferring data. Integrated Gigabit Ethernet allows high-speed wired network transfers while a USB 802.11n WiFi adapter is bundled for users that desires wireless network connectivity. 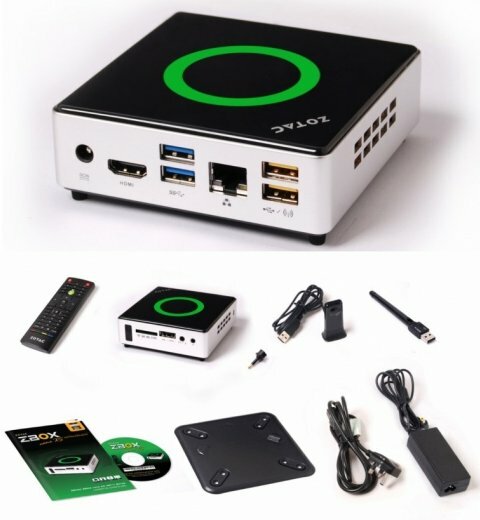 It’s time to play with the ZOTAC ZBOX nano XS AD11.